The aircraft style Right Angle Power Drill Attachment allows work to be done in areas with only 2" of clearance. The tool is capable of drilling up to 1/4" diameter holes and compatible with all standard power drills. Utilization of a molded cavity insures a consistent fit for the precision-made internal components, which include: steel machined internally threaded (1/4-28 UNF-2B) beveled miter gears, hardened thrust block and driveshaft, and oil-impregnated bearings. The housing which hinges open for easy periodic lubrication is sleeved by a non-slip knurled aluminum grip, that is black anodized for appearance. 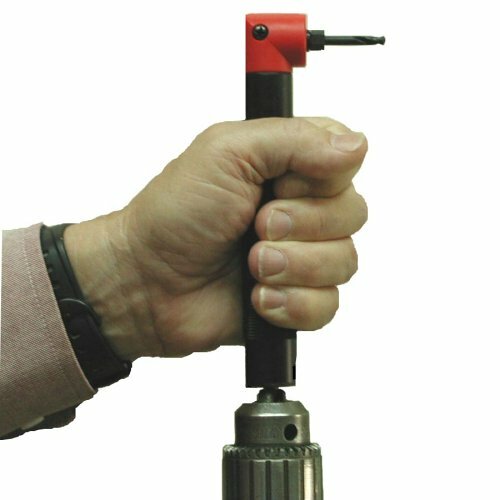 In addition to TightFit® drill bits, the Right Angle Power Drill Attachment allows close-quarter use of many other threaded tools. Note: Required threaded TightFit® drill bits can be purchased separately by going to our website www.TightFitTools.com and then going to the drill bits section. Attaches to any power drill (corded/electric or cordless/battery). Recommended operating speed not to exceed 2500 rpm. Light weight; right angle drill weighs 1/3 of a pound. Threaded components allow for quick and easy tool changes. One year warranty, 30 day no-risk trial. Instead look at Vermont American 17172 Dual Speed angle drive kit About $30 at Ace. This isn't listed on most search engines. Even with this one, open it up right away and check for lots of grease in the gears & oil in the bushings. After 5 or 6 holes open it up and see if you need a shim washer tween the first bushing and the gear,both sides. Might want to add oil& grease holes to the housing. Good preventive maintance will extend the life of ANY tool cheap-o or not. Note: I keep my chuck key on my key chain, haven't lost it yet. :-) I've never seen a warrenty I couldn't void. I purchased this drill this past September. I used it for 2 days with a first bit to drill about 10 holes. Then I changed to another bit and hand-tightened it, but while doing so, the drill bit fell out of the casing. When I tried to back out the casing by hand I could not because it had frozen in its seating ... and the shaft you attach to the drill no longer turns the casing adapter. While it is under warranty, I must pay shipping costs and be without it use for several weeks. I owned one about 20 years ago. It looks like they made some cosmetic changes to it since then, but the one I owned didn't last long. The gears stripped out of the head and the company wouldn't stand behind the then "unlimited, lifetime" warranty after repeated contacts with them directly and through my states consumer protection dept.. I can't imagine that this unit is still advertised for work in the aircraft industry. If they use this for building aircraft, they must be replacing dozens a day! If you want a close quarter right angle drill attachment, I recommend the Milwaukee 49-22-8510 Right Angle Drill Attachment Kit-it's a well built tool. I own one. A little more costly and not as able to get into quite as tight a space where this one gets into, but will surely last longer. Most of the ability to get into tight spots is the because of the length of the drill bits you can buy from them and I believe them only. I wish Milwaukee had a chuck for their right angle tool that could use this company's very short bits because I found nothing wrong with their drill bits. While I have only used it for a few weeks, I would have to say mine has not given me any trouble at all, yet. It doesn't have the feel of a tool that will last forever, but I think I will at least get my money's worth. Watch the RPM limitation (2500) and make sure you support the attachment firmly with one hand; it's easy to let things get out of alignment and break off a bit if you're drilling metal (guess how I know about that).